A multi layered metal enamel lapel pin in glossy black on brass. It is antiqued - chipped and scratched around the edges for a vintage look. 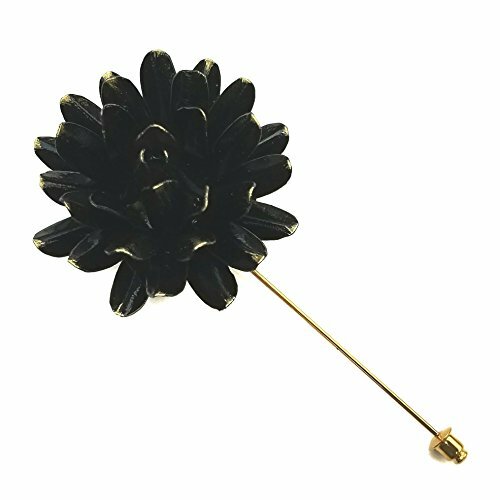 This marigold flower measures 1.8 inches across (@4.7 cm) and is made of thin layers of brass petals, so it's sturdy but still light enough not to pull your suit. The length including the pin is 3 5/8" (8.7 cm) Each one will have very slight differences as they are individually cut, bent and painted. The pin is gold tone alloy metal with a safety clutch. It will come packaged in a kraft logo box, ready for gifting. If you have any questions about this product by Alicia's Oddities, contact us by completing and submitting the form below. If you are looking for a specif part number, please include it with your message.